Joe Castle, founder and chief executive officer of Castle Auto Group as well as SOCIALDEALER will be sharing his digital expertise in a free Webinar. The session titled “Moving Your Dealership into the Digital Era,” is set for 1 p.m. ET on Dec. 5. In the Webinar, Castle will explain step-by-step how he used digital strategies to flip his Castle Chevy and Castle Buick GMC stores from poor performers to dealerships with sales gains of more than 200 percent and gross profits more than $5.2 million annually. —How to take the giant step of moving traditional ad dollars into digital ad dollars while reducing your advertising expense and increasing ROI. —How to re-align your employees to handle the new digital sales process and reduce your overall wages. —What your financial statements and advertising budget should look in a digital dealership. —What your percentages to gross should look like in key areas like personnel, variable expenses and semi-variable expenses. —How your dealership will build more “cash in the bank” when making these changes. All attendees who sign up for the webinar will receive a free month of Facebook Auto Content from SOCIALDEALER. Dealers and managers can sign up for the Webinar here. For more information on SOCIALDEALER and Castle, visit www.socialdealer.com. As the holidays approach, Chrysler Group employees in the Midwest are reaching out in an effort to fight hunger at Thanksgiving. Last week, “everything from canned fruit and vegetables to cranberry sauce, pumpkin pie filling and stuffing mix” was packed up and loaded into Chrysler Group vehicles for delivery to local food pantries in the company's plant communities located in Michigan, Ohio, Indiana and Illinois. "We're moved by the generosity of Chrysler Group employees, who once again responded to assist their neighbors during this holiday season," said Jody Trapasso, senior vice president of external affairs at Chrysler Group and president of The Chrysler Foundation. "Chrysler is committed to strengthening our communities and to helping fight hunger." This is part of the annual Chrysler Group Thanksgiving Food Drive, taking place in partnership with the UAW. Moreover, The Chrysler Foundation, the philanthropic arm of Chrysler Group, purchased more than 1,500 frozen turkeys, which will also be distributed by the food pantries. Just last year, the company's food drive helped feed more than 12,000 people. The food drive was conducted November 1 through 14 and encompasses most of the company's U.S. offices and plants. Southeast Michigan: Chrysler Group employees formed a caravan comprised of Dodge and Chrysler minivans, Ram trucks and Dodge Durangos to deliver food collected at 17 of the company's locations in Southeast Michigan to Gleaners. Community Food Bank of Southeastern Michigan, Lighthouse of Oakland County and HOPE Center in Macomb. Ohio: Employees from Chrysler Group's Toledo Assembly Complex and Toledo Machining Plant joined forces to deliver food to The Salvation Army of Northwest Ohio. Indiana: Employees from Chrysler Group's Kokomo Casting Plant delivered food to Kokomo Urban Outreach. Employees at the Company's Indiana Transmission Plants held a similar drive on Nov. 9. Illinois: Belvidere Assembly Plant employees will deliver food to the Belvidere/Boone County Food Pantry today. 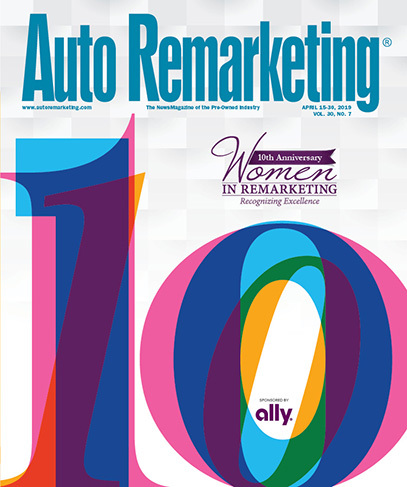 This year’s class of Women in Remarketing honorees were spotlighted Thursday afternoon at Used Car Week, but these leaders of the used-car business did more than just receive awards. One of the questions Costabile asked the Women in Remarketing honorees was about the definition of success. Manheim’s Susie Heins said it’s about being excited and happy about what you’re doing. In that spirit, Keely Smith of AutoIMS stressed the need to approach everything with a sense of humor, which can not only bring people together but diffuse difficult situations. She also advised leaders to be mentors, givers and lifelong learners. Next up, Repo Remarketing’s Claudia Plascensia, Hare Chevrolet’s Courtney Cole and Wheels Inc.’s Lori Coniglio were asked what inspires them both professionally and personally. Starting with Plascensia, it’s the opportunity to help her employees and corporation succeed; and personally, what inspires her is her family, she said. Costabile also posed a question about the best piece of wisdom the Women in Remarketing honorees had received. Allison Lind of Mercedes-Benz USA said she has learned to stop and listen to the other side first before making a decision. She said that “you might not make everyone happy,” but at least you will have considered all vantage points and made a more educated decision. Dealers Auto Auction of the SouthWest’s Stephanie Gringas said the best advice she ever received was to “know the value of a car.” Doing so, she said, has helped her build trust. Lastly, Amy Weisenburger of DataScan Field Services and Mary Jane Hogan of American Recovery Association were asked what advice they would have for women striving to get to the top but facing resistance. Hogan said it’s not about being a woman, necessarily. Be a team player, she said, and listen to others. And it’s also about whom you surround yourself with. “Surround yourself with good people,” Weisenburger said. One way to view the car business, as Hare Chevrolet dealer principal Courtney Cole put it, is to look at it as “riches and niches.” And the used-car business is full of those “niches” of business opportunity for dealers, particularly as credit availability opens up. Cole was speaking on two panel discussions Thursday morning at the National Remarketing Conference, offering the dealer perspective during sessions taking an in-depth look at used-car market for 2012 and beyond. One of those panels was a discussion involving four of the five Used-Car All Stars that were honored Thursday at NRC: Cole, Larry H. Miller Group’s Greg Johnson, West-Herr Automotive Group’s Jack Anderson and Earnhardt Automotive Group’s Gene Detrick. (Sonic Automotive’s Hal McLarty was the fifth honoree, but was not in attendance). Dan Kennedy, manager of remarketing at General Motors, presented the quartet with their awards during a ceremony prior to the “Top Trends in the 2012–2013 Used Car Industry,” where the four recipients shared some best practices and strategies they have honed for success in the used-car business. But the best practices weren’t just limited to dealers. To prompt closing remarks, the dealers were asked about what they would like to see from their auction partners. Anderson emphasized the need for stronger notification for when cars will be available and healthier communication. Cole said any kind of mobile enhancements/offerings are beneficial, and similarly, Johnson noted the benefits of technology in the auction marketplace. When the remarks made their way down to Detrick, he said humorously, “All of the above.” He then later honed in on the importance of consistency in online vehicle descriptions. Earlier Thursday, another panel — “The State of the Used-Car Industry” — included Cole as well as some representation from the rental, financial and OEM side of the business. Joining Cole were John Gottschalk of Ford Direct, Steve Harward of TD Auto Finance, Greg Thibault of Avis Budget Group and GM’s Jennifer Costabile. One of the angles to the conversation was that of used-car supply. Sharing her perspective from GM, Costabile noted that while lease return volume still has a ways to go, she said there’s been some encouragement from GM to fleet clients to turn their fleets now while prices are high; which benefits both the automaker and the fleet companies themselves. Cole shared an interesting point about used inventory acquisition, pointing to a strategy from her Chevy store. When prices hit a dip, they buy as many vehicles as they can. Another major topic of discussion was technology and the increasing presence of the Internet. For instance, when asked what areas of technology that have piqued interest, Harward emphasized the importance of technology that makes buyers more comfortable. Gottschalk was asked what the best dealers are doing to utilize FordDirect on both the new- and used-car sides of the business. He stressed things like mobile-enabled websites, the importance of photographs, easy-to-use websites, and maintaining one’s reputation online. And in his closing comments, Gottschalk had a message for the remarketing side of the business: the advent of online channels is great, but he implored the importance of keeping focus on the dealer. As 2013 nears closer and closer, dealers and others in the industry look back on the trials and triumphs of 2012. From tight used inventory to the recent Hurricane Sandy, dealers have been presented with some tough situations this year. But as 2012 comes to a close, many industry experts gave Auto Remarketing some promising predications for the new year. First up, Steve Kapusta, vice president of SmartAuction, said dealers should expect a better used supply situation in 2013. But he provided a caveat, noting it will still be tight relative to historical highs. Kapusta — who participated in the Executive Suite Panel Thursday at the National Remarketing Conference — also touched on where used prices are headed this coming year. “Used vehicle pricing and demand will continue to be strong. Access to funding will be plentiful and enable sustained growth,” he said. Earlier this season, NADA Used Car Guide had similar predictions, noting that it expects used prices in the first quarter of 2013 to increase by 5.2 percent. That said, the price hike isn’t expected to be quite as high as in past years. “The predicted increase for the first quarter is 1.5 percentage points lower than the 6.7 percent rise recorded in the first quarter of 2012, when lower gasoline prices and strong employment growth helped push used prices up more significantly,” NADA UCG explained. This expected price increase will put prices at 0.8 percent below the average recorded in the first quarter of 2012. “While the loss in average value is small, this will mark the first time since 2009 that prices in the first quarter were lower than they were in the preceding year,” NADA UCG said. Overall, NADA UCG says the used market remains “favorable” for dealers. But there may be one factor that could threaten the balance. NADA expects “the shift in preference toward the new vehicle market will” to be mildly detrimental to used-vehicle prices. That said, other factors, such as tight supply, “will help support used prices and minimize value losses associated with emerging new-vehicle preference,” NADA UCG added. The organization also noted a few other factors that may be contribute to a healthy used-car market: improving credit accessibility and the recovery in the housing market. “And even though job growth through the first quarter of next year is expected to be minimal, it’s anticipated that it will steadily improve as the year wears on,” officials added. NADA UCG expects this consistent growth will help support the release of used-vehicle demand from the set of consumers who traditionally purchase only used cars and trucks. “Overall, NADA’s near-term outlook for the used vehicle market is positive. While used-vehicle prices are expected to flatten out and then dip slightly in the first quarter relative to year-ago levels, prices aren’t expected to drop precipitously and instead will remain high by historical standards,” officials concluded. And NADA isn’t the only ones expecting a good year for the used market. Lastly, Kapusta offered a few tips for dealers as we prepare to move into 2013, when asked about challenges and opportunities for dealers in the new year. “Competition in the used car market continues to heat up from the franchised dealer network. The use and efficiency of technology is a must. Inventory management is crucial,” Kapusta said. Kelly Blue Book and AutoTrader.com stressed that although current estimates state between 200,000 and 300,000 new and used vehicles were destroyed as a result of the storm, this number only represents 0.1 percent of the more than 240 million registered vehicles on the road. "There's absolutely no question that Superstorm Sandy has had a devastating impact on those who live in the Northeast," said Chip Perry, president and chief executive officer at AutoTrader Group. "I've personally visited the area and spoken with many of our field sales representatives and customers, and it's clear that this event changed many of their lives. "But when you look at the impact on the automotive industry, the fact is, the number of vehicles lost is too small of a fraction to significantly move the national market,” he added. And KBB backed up its assertions with data and analysis from the November Kelley Blue Book Market Report. The company noted that the timing of the storm may lessen the effect. Since the storm hit so late in the year, KBB.com analysts believe increased demand on the East Coast will only "mute" the market's typical decline through this time period; instead of a 1 to 2 percent decline, KBB.com experts now believe values will remain flat nationally. And the company doesn’t expect used prices to spike to high as a result of the storm, either. From a used-car pricing perspective, KBB senior market analyst Alec Gutierrez anticipates only modest market increases, $200 to $300 at most, isolated mainly in the Northeast region. "When Hurricane Katrina hit, Kelley Blue Book Values increased more than 2 to 3 percent in the affected area from the time the storm hit until year-end," Gutierrez said. "This year, we believe that while we may see some price appreciation on the East Coast, from a national perspective, values will remain relatively flat." As for AutoTrader.com, the site shared that shopping activity in the areas impacted by Sandy dipped several percentage points between Oct. 27 and Nov. 6 (during and immediately following the storm). That said, this number rebounded by Nov. 8 and looked much the same as the areas Hurricane Sandy missed. “On Nov. 10, shopping activity began to increase very slightly nationally and in the impacted areas, however, AutoTrader.com analysts believe it's still too early to assess if this is indicative of a more sustained trend or if the rise can be directly attributed to Superstorm Sandy,” officials said. Gutierrez said, "It's going to take time for impacted consumers to get back in the market. Some may have been able to get a replacement vehicle immediately, but many others could be waiting for their insurance check or unfortunately have to focus on repairing damage to their home. We're going to be keeping a close eye on this in the months ahead." Though the numbers suggest the impact on the industry will be lesser than storms in the nation’s recent past, flood-damaged vehicles still remain a concern. And Superstorm Sandy has increased the potential for these vehicles to find their way into the market. Offering some background information, research through Experian Automotive's AutoCheck database has shown that more than 1.6 million cars and trucks throughout the United States were designated as damaged by accidents or severe weather, including hurricanes, tornadoes or flooding, in the first half of 2012. “Of those, more than 425,000 — nearly 27 percent — lost their damage designation, or brand, when they were retitled as clean in another state,” officials said. Scott Waldron, president of Experian Automotive, commented on the issue, saying, "In the wake of any natural disaster, consumers need to be acutely aware that there will be damaged vehicles out there that will be cleaned up and sold to unsuspecting buyers. "With such a large number of title-washed vehicles on the road today, consumers need to arm themselves with as much information as possible when shopping for a used vehicle. An AutoCheck vehicle history report includes past title brands and designations of prior damage, providing used vehicle shoppers with the peace of mind that the vehicle they are buying is reliable and, most importantly, safe,” he continued. To help further protect consumers against purchasing a potentially damaged vehicle, Experian Automotive is launching a free online tool called Storm Scan. This tool can identify if a vehicle has suffered any major damage events possibly caused from the storm or whether the vehicle has been titled/registered within the affected area in the past 12 months, the company shared. Moreover, the company is offering AutoCheck vehicle history reports at a 15 percent discount for all consumers in the counties recently declared federal disaster areas.